Congress created the Home Owners' Loan Corporation (HOLC) in 1933 to rescue the real estate industry and restructure the home mortgage market. In the process, HOLC also strengthened residential racial segregation. 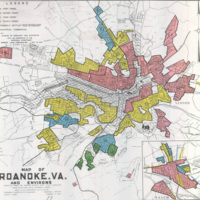 HOLC promoted racial covenants on deeds to prevent mixed-race neighborhoods and created color-coded maps of American cities that made race a key element in assessing financial risk. This exhibit explores the actions of HOLC in Virginia and its impact on Virginia cities. It was originally an exhibit from 12/7/2016 to 2/17/2017 in Newman Library at Virginia Tech.